There’s nothing I love more than doing a stay-cation, except for doing a spa stay-cation! Sometimes a quick two-night getaway is exactly what you need to relax and recharge so you can tackle planning your wedding. 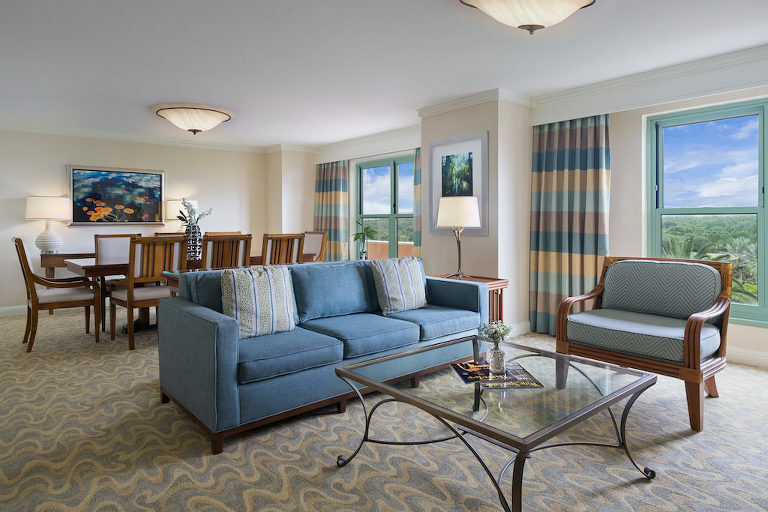 I’m a huge fan of the Marriott brand (I’ve been a “Platinum” member for years), so I booked a romantic weekend stay at the JW Marriott Orlando Grande Lakes with two priorities: great food and lots of downtime. The hotel is just under an hour and half drive from Tampa, which honestly is the same time it could take to get to Clearwater Beach on some weekends! What’s great about this particular location is that Grande Lakes is home to two properties: the JW Marriott and Ritz-Carlton. 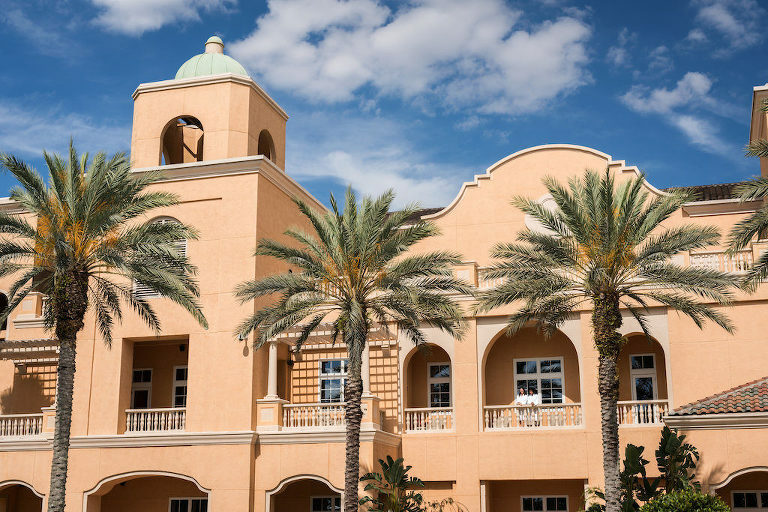 Set on 500 acres, with multiple restaurants, bars, a 40,000-square foot spa, state of the art fitness center and 18-hole Greg Norman designed championship golf course, you can park your car and indulge in a luxurious couples weekend, without leaving the resort. The 1,000 guest room JW Marriott is designed for the luxury traveler who appreciates hotel features such as oversized lobby fountains, marble bathtubs and and room views of the pool, lawns, lakes and golf course. It features multiple on-site restaurants, ranging from casual to fine dining (read more about that below), sushi, an on-site nano craft brewery and farm-to-table menus, with ingredients from the properties’ on-site garden! I’ve been a long-time and loyal Marriott traveler, so I often get upgraded when we travel because of my Platinum status. We lucked out and received a 1-bedroom suite, complete with kitchen, full dining room and living room! 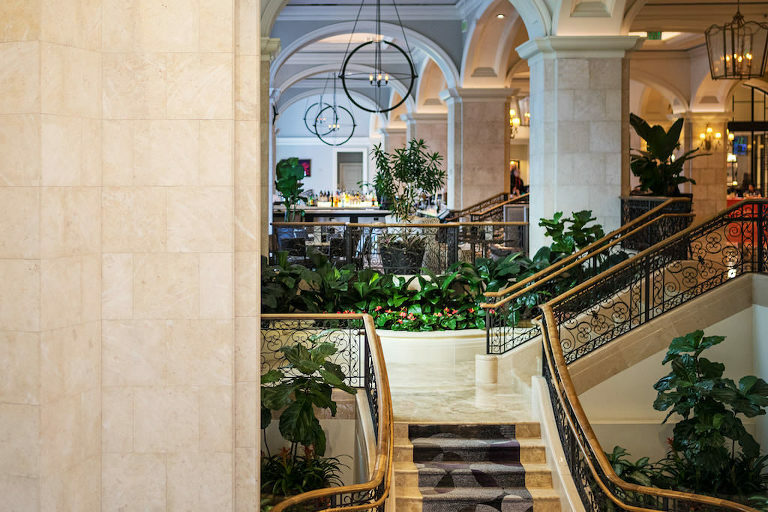 One of the best perks of staying at JW Marriott Orlando Grande Lakes is that you get access to the award-winning 40,000-square-foot Ritz-Carlton spa, which features 40 treatment rooms and a 6,000-square-foot fitness center. We spent the ENTIRE day here! The lush garden landscaping around the 40,000 square foot spa creates a secluded and serene atmosphere and the Spanish-Moorish architecture makes you feel like you’re in another country, which is the perfect staycation setting! We began the day with a workout in state-of-art fitness center on the Technogym equipment. This was the nicest and largest hotel gym, I’ve ever seen (and I’ve traveled a lot! ), plus it’s open 24/7. It’s so spacious and everything looks brand new, plus towels, bottled water and headphones are complimentary. In addition to the cardio equipment and weight machines, I love that there is stretching equipment and a yoga studio perfect for post-workout stretching or if you just want to relax during your spa-cation. For travelers who want to keep their fitness routine at its peak, personal training is available. After our sweat session, we headed over to Vitale Spa Cafe for a refreshing an healthy lunch. We started with the Vitale Trio, which included organic crushed avocado, tzatziki dip, hummus, pita chips and lavash. The lavash is baked in-house and honestly the best “cracker” I’ve ever had. It was THAT good! For our main dish, we split the Vitale Blue Crab salad. The salad features locally grown mixed greens, avocado, blue crab, sunflower seeds, fresh hearts of palm, herbed cheese and champagne vinaigrette. The serving size was huge (it fed both of us post-workout) and was indulgent, yet light and refreshing. I could eat this every day for lunch! The smoothies were fresh and delicious and the perfect recharge after our gym session. The menu also includes cocktails, beer, wine and bubbly, turning your spa lunch in a leisurely girls luncheon or relaxed “date afternoon” with your fiancé! The spa attendant showed me to my complimentary locker for the day, which included plush robe and slippers. There is just something about these items that immediately tells my body to relax. It just feels so indulgent! I enjoyed the tri-fecta: steam room, whirlpool and sauna, then read book on the terrace overlooking the outdoor pool. It was so peaceful and the view is so gorgeous, you’ll forget that you’re still in Orlando! After a few hours apart, the bf and I regrouped on the top floor coed-lounge, stretched out on the plush chairs and silently read. While we didn’t do any additional services that day, I’ll have to make it back to try the signature service, a “zero gravity” massage performed as you sway gently in a rocking hammock. Can you say ultimate pampering? So I have to admit, the first night we arrive to the hotel, we ate off-property at a “fine Italian restaurant” (the bf is Italian). While it was good, it wasn’t worth what we paid, and I don’t see myself going back there. The second night, we stayed on property and dined at Primo, and it was PHENOMENAL! It’s hard to find good Italian food in West and Central Florida, but this restaurant was on point, which is probably why it was once named “Critic’s Choice Best Italian Restaurant in Orlando” by the Orlando Sentinel. The chef, Melissa Kelly, incorporates organic ingredients grown on-property at the Grande Lakes gardens and has a contemporary take Italian cuisine. Chef Melissa grew up cooking in her Italian grandmother’s kitchen (aren’t grandma’s the best teachers?) and was named the 1999 and 2013 James Beard Foundation’s Best Chef: Northeast. I highly suggest reservations on a weekend night, as there can be a bit of a wait, but luckily the hotel bar is just down the hall. The atmosphere is romantic and upscale, but not too stuffy. We were seated in a curved comfy booth, which I love because you can sit next to each other and it doesn’t look awkward. Our insalata course started with heirloom tomato and burrata salad with pesto, fig balsamic and extra virgin olive oil and a baked crostini. The tomatoes bursted with flavor and the burrata cheese added a creamy texture. I discovered burrata last year and tend to order it anytime I see it on the menu. For our main dish, we chose the veal osso bucco with paramesan polenta, sautéed kale and citrus gremolata (seaonsings typically containing: lemon zest, garlic, parsley and anchovy). Oh the veal melted in your mouth! The sauce was rich, the polenta was creamy and if a main dish could be indulgent like a dessert, then this should be a dessert! I’m not a huge meat eater, so I wasn’t sure if I’d like the veal, but all the flavors made it a very palatable dish and it wasn’t gamey at all. I would highly recommend visiting Primo, even if you’re not a guest at the hotel. It’s a great date night or special occasion spot, and after dinner you can walk the grounds of the resort (trust me, you’ll need it after eating all that amazing food!) and take the beautiful decor and fountains. It’s a much better way to end your night rather than just walking to the parking lot and getting in your car. One of the best things about staying at the JW Marriott Orlando Grande Lakes is that it truly is a resort, with tons to do. You do not have to leave the property to fill your entire weekend. We wanted to keep this a relaxing spa focused weekend, but after our dinner at Primo, we we’re ready to go to bed, so we watched the live musician at the hotel bar, who was excellent! He sang with current Top 40 music tracks, giving you the best of both worlds: a DJ and singer! To let our food settle, we decided to venture over to the Ritz-Carlton side of the property. After roaming the grand hallways and beautiful outdoor courtyards, we ended up at Highball and Harvest, a farm-to-table restaurant with great drinks, fresh food and a upscale bar atmosphere. This is great place to for your large crowd (bachelorettes/bachelors) to hang out in the lounge and catch up over drinks. It’s open until 11 p.m., so it’s a great after dinner spot (though I highly recommend the restaurant side too!) We played table shuffleboard and had so much fun. 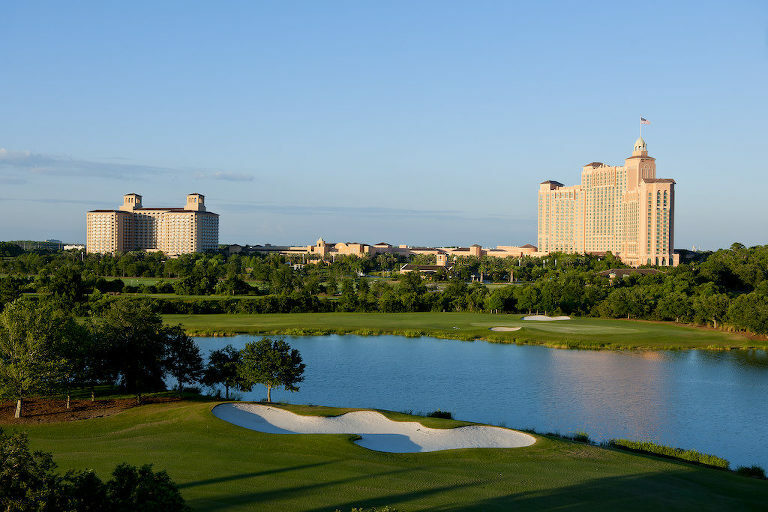 For the outdoor types, the Grande Lakes properties are home to an 18-hole golf course surrounded by preserved wetlands and natural woodlands, with the final three holes finishing by the towering hotels and amenities. Unlike many Florida golf courses, this one feels wide open because there are housing developments within this federally protected preserve area. It was designed by two-time British Open champion and PGA Tour icon Greg Norman and features an 11,000-square-foot clubhouse and 65,000-square-foot practice range. If golf isn’t your thing, the resort also offers a 40-acre fishing pond, canoe or kayak eco-tours, mountain bike trails, tennis, 4,000-square-foot winding, lazy river pool, and “sunrise safari” in an all-terrain golf cart with a glimpse of deer, bobcats, otters, foxes, birds and alligators. 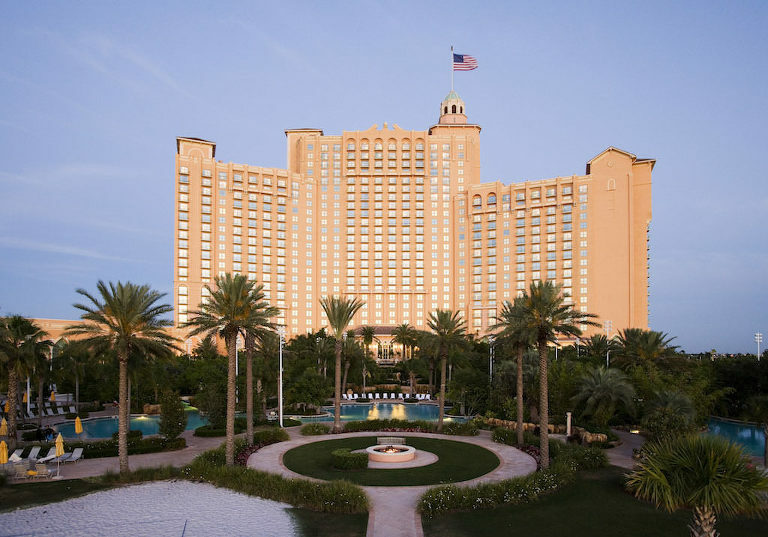 *JW Marriott Grande Lakes sponsored our spa amenities and on-site dining. All opinions are the author’s own are not endorsed by JW Marriott Grande Lakes, Ritz-Carlton Grande Lakes or their affiliates.